Penguins today are not found north of the Equator, except in zoos and on Christmas cards, but this was not always the case. What follows is a sad tale of how the penguin of the north met its demise. Off the coast of England, secluded by blankets of fog and gray rain clouds, is Lundy, which translates to the old Norse words for “puffin island”. This enormous block of granite rises over a hundred meters above the treacherous seas that surround it. Its towering, rocky cliffs and ledges providing breeding grounds for thousands of seabirds. It was here in 1835 that an islander saw a pair birds, the likes of which he had never seen before. He called them the “king and queen murres...because they were so big and stood up so bold-like”. Only one bird fits such a description. By the time of this encounter, the species in question had become so rare that to locals they were little more than legend. They spoke of a murre so large it was unable to fly, with a beak big enough to make that of its cousin, the Razorbill, seem small in comparison. This original “penguin” was in fact the now-extinct Great Auk (Pinguinus impennis), once found in vast numbers around northern shores of the Atlantic. 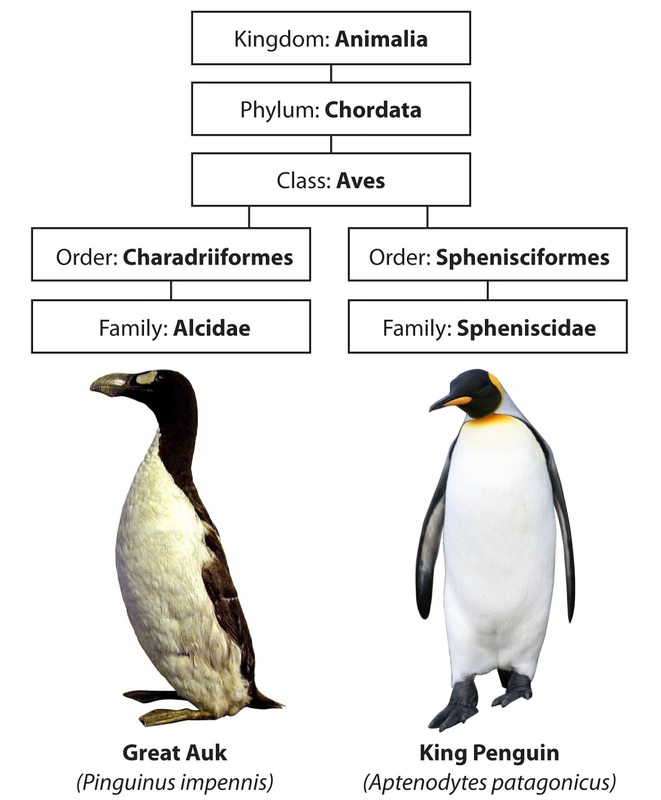 Although no relation to true penguins, they were similar in appearance, filling much the same ecological niche as the King Penguin that lives on the islands around Antarctica. In fact the word “penguin” was initially a synonym for Great Auk, and is thought to have come from the Welsh pen gwyn which means “white head”. As Europeans travelled to southern seas, the word was used to describe the birds they found there. 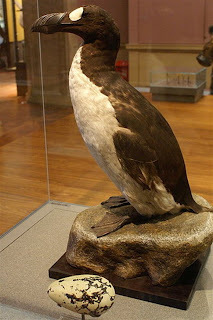 As the Great Auk passed into legend among the people of the North, it was quickly acquiring a prominent reputation among collectors. Its last hideouts were sought out by seamen looking for specimens to sell to wealthy collectors and museums for incredibly high sums. Some 78 skins and 75 eggs have been recorded and throughout the nineteenth century examples were regularly offered for sale, many of them at Stevens Auction Rooms in London, a venue celebrated for the natural history items they sold. So close was the connection of this firm with the dispersal of remains of the Great Auk, that its address was simply, “Auks, London”. In early years, Great Auks and their eggs fetched just a few pounds each but by 1900 a choice egg sold for £330. By 1971, a stuffed bird sold in London to an Icelandic museum for a record £9,000. specimen and replica egg, Glasgow. The eggs of the Great Auk, for which there was such fierce competition, were dirty yellow-white in color, particularly around the fat end, with an irregular pattern of pale grey or brown. A single, large egg was laid—about as large as an Emu egg, and pyriform shaped, so that when nudged they move in a tight circle instead of rolling away and being dashed to bits on the rocks. This feature is of great importance to a bird that makes no nest. On the rocky platforms that provided the Auks with their home, territory would be defended by a few low croaks. The beak could be used to administer an unpleasant bite but, apart from this, Auks were more or less defenceless. At breeding colonies, their great size set them apart from the other murres but they could also be immediately distinguished from the Guillemot and the Razorbill by their more upright stance. Most eggs were found in June and hatched by July. Their diet was made up of fish, crustaceans and other marine invertebrates which the Auk could pursue through the water with tremendous speed and agility. 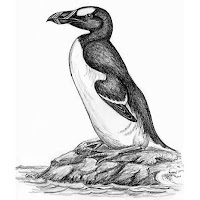 At one time the Great Auk was widely distributed across the North Atlantic, from the Gulf of St. Lawrence in the west to Norway in the east and as far south as the Channel Islands. The Little Ice Age pushed the Auks south as these birds could not thrive under arctic conditions. With the advance of the great ice sheets during this time, more of their breeding islands became exposed to polar bears. Despite their wide distribution, Great Auks preferred to breed in colonies at just a few select locations, leaving many seemingly suitable sites unoccupied. Rookeries were known to exist at the Gulf of St. Lawrence, the Newfoundland coast, near Iceland, and at St Kilda. The Great Auk was an excellent swimmer, using its wings to propel itself underwater. On land it was clumsy and slow, waddling as it dragged itself across rocky shores. Their large size, combined with a pathetic inability to fly or evade capture, made the Great Auk an easy target for hunters. To those who eked out a meager living among the bleak isles of the north, or sailors and fishermen anxious to replenish stocks before venturing into the icy waters of the Arctic, such a bird was irresistible. Vast numbers were slaughtered for their feathers which were used to make pillows. On Funk Island, the unfortunate creatures were herded into pens, clubbed to death and tossed into vats of boiling water to loosen their feathers. The fires beneath these cauldrons were fuelled by the fat and oil from auks that had already met a similar fate. By 1800, the Great Auk was all but gone. The few recorded encounters with the species after this time make up a sordid list of human cruelty and ignorance. One bird was captured on St Kilda. Two men and two boys spotted it from a boat, sitting upon a low ledge. 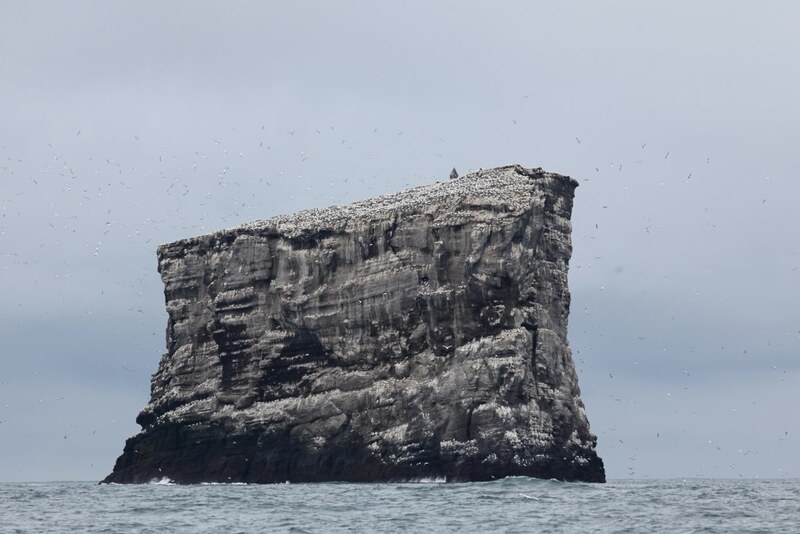 The men landed at either end of the shelf and began a steady approach while the boys rowed close to the rock, just below the spot where the bird was resting. As the men drew nearer, the Auk, by now becoming increasingly alarmed, made a desperate bid for the safety of the water but instead jumped straight into the arms of one of the waiting boys. This bird was kept alive and sent to Edinburgh, but managed to escape during one of its leashed swims, never to be seen again. Many years later, an elder resident of St Kilda claimed to have caught a Great Auk with the help of two accomplices. The bird was found sleeping and was captured and taken to the islander’s hut. There they kept it in captivity for three days, until a big storm arose. Thinking that the bird had caused the storm and was really a witch, they clubbed it to death. Eldey island, the last home of the Great Auk. The Great Auks’ last colony was on Geirfuglasker, an islet off the coast of Iceland, but in 1830, it was sunk by volcanic activity. Nearly 50 of the surviving birds continued to breed on the nearby Eldey island and it was here that the species was hunted for the last time. The colony had been ravaged by museum collectors for over a decade, when on the morning of July 3, 1844, a party of three sailors landed on the island. Among a group of Guillemots, they spotted a pair of Great Auks and immediately attacked. The frightened creatures frantically tried to escape, but were overtaken. One was trapped between rocks and the other captured just a few steps from safety. Both were strangled to death. The female had been sitting on an egg which was crushed during the scuffle. Their skins were sold to a collector in Reykjavik. And while no doubt other individuals lingered here and there, soon after, somewhere in the cold and lonely waters of the North Atlantic, the last arctic penguin died.